Anchor damage is a key threat to coral reefs around the world, according to the International Coral Reef Initiative and the US Coral Reef Task Force. Day-use moorings have proven to be an effective tool to help prevent this coral damage by enabling boats to tie up to mooring buoys instead of dropping anchors onto the coral reefs. Hawaiʻi’s first day-use moorings were installed on the Kona coast in May 1990 as an innovative partnership among community members, ocean tourism businesses, non-governmental organizations, and the University of Hawaiʻi Sea Grant Extension Service. Over the years, with leadership from Malama Kai Foundation, other coastal communities and ocean tourism businesses throughout the state have been inspired to follow this example. Today there is a statewide system of about 220 day-use moorings around the main Hawaiian Islands. These buoys are for short-term, day-time use only, on a "first-come, first-served" basis. Funding for the installation and maintenance of these day-use mooring buoys has come primarily through private donations and grants to Malama Kai Foundation, and volunteers continue to provide equipment and manpower. What makes these day-use moorings so effective in protecting coral reefs is the mooring pin technology first developed in 1981 by John Halas and adapted for Hawaii's hard lava substrate. The moorings consists of a 3/4 inch stainless steel eyebolt (or pin) 18 inches long that is cemented into a hole drilled into the reef substrate. In sandy or soft bottom areas a specialized “manta” unit is driven deep into the soft substrate. Attached to the the fixed eyebolt (pin or manta), which is all that protrudes from the otherwise pristine reef or bottom area, is a chain bridle and 7/8 inch nylon line. The mooring tackle and line is attached to an 18” buoy placed about 10-ft. below the surface. 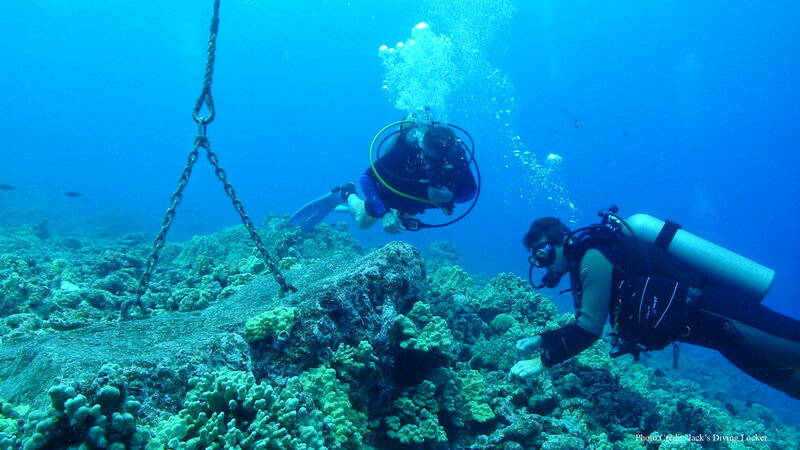 During the 1980's, Jerry Garcia, lead guitarist and vocalist of the Grateful Dead, spent a lot of time diving Hawai'i's reefs and recognized the reef-saving potential of the mooring program. He was so impressed that not only did he testify on behalf of the mooring program at a Hawai'i State hearing, but he made a sizable donation that was the beginnings of Malama Kai Foundation!